I had a call to help my relative install something to open MS Word files. I thought this would be easy - install the free OpenOffice.org. (His computer came with a 60 day trial of MS Office 2003, which had since expired.) Unfortunately, most of the files he needed to open were actually *.wps files for Microsoft Works. Works was failing to open due to an error, and the current "vanilla" version of OpenOffice.org doesn't support the MS Works file format. 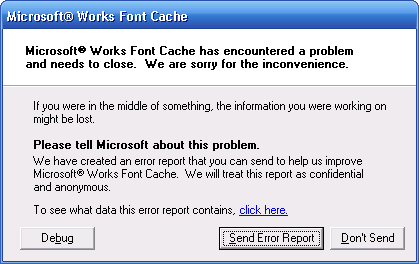 Several searches suggested that this could be solved by forcing Windows' font cache to rebuild. Most included removing the C:\Windows\ttfCache file (not folder), which doesn't even appear to exist under current versions of Windows (XP or newer). There is a C:\windows\system32\FNTCACHE.dat file, but renaming this didn't help. What I found is that this was caused by the printing system. Temporarily stopping the "Print Spooler" Windows service (Spooler) prevented the error and allowed Works to start. After restarting the Spooler service, I found that removing the HP printer drivers also provided a work-around. Removing and installing the 11.0.0 (06-200) version of the "HP Deskjet Basic Driver" didn't help either, nor did re-installing the above updates. There were other issues with this machine, so I went ahead with a back-up and reinstall operation. Unfortunately, there was no stand-alone Windows XP installation disc with the system, just the factory restore partition - so I used that instead. (This is also a Hewlett-Packard / Compaq computer system.) It would be possible to "customize" a XP install disc that would work with the OEM key on the system, but I didn't have the time for this - though it probably would have saved me time in the long-run. After re-installing, I ended up with exactly the same issues - again. We're sorry, but an unexpected error has occurred. The error has been logged and will be examined for further review. 2009-05-02 21:14:05Z Error on 15.201.8.161: Unhandled exception caught: Error Message: Input string was not in a correct format. I gave up and called the 800 technical support number. When I was connected to a representative, I explained that their online chat system appeared to be broken, and his answer was that it must be because it is the weekend (!). The HP representative said he recognized this error, and suggested trying to create a new user profile. I feel a bit disappointed for not trying this myself first, as it is a usual part of my troubleshooting routine. Sure enough, this solved the issue - for both the printer driver and MS Works. In this case, even the system reinstall didn't help, as HP's default user profile included in the recovery partition was already "corrupt". Having previously searched HP's online knowledge base, there were no results for "0xC0000005" - so I strongly suggested that this be included for future searches. I was also surprised that general online searching for 0xC0000005 errors returned a number of results, but no real solutions and nothing related to the user profile. It should be possible to correct this issue in the current user profile without starting a new, "clean" user profile. However, I haven't found any obvious fixes - such as something to reset under "Hewlett-Packard" in the registry or the user profile folder. Hopefully, as with my previous post on HP driver issues, this post will become helpful to many other users. This information is incredible. Thanks for taking the time to be so detailed in your post. Love the screen shots by the way. HP support is a waste of time and I find that sometimes the best way to find a resolution is seek out others who have had the same problems. Thanks for the info and keep up the good work. Check us out anytime and send me an email for a discount code.